Thousands of people have gathered in Istanbul to pay tribute to Kurdish activists killed in Paris, amid reports of fresh air strikes in Iraq. 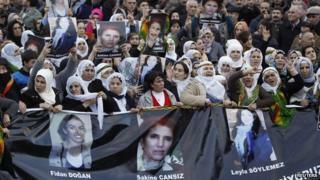 The bodies of three female activists of the separatist PKK (Kurdistan Worker's Party) are to be buried in Turkey. Meanwhile in Iraq, Turkish jets reportedly bombed Kurdish targets for the third day running. Officials have been in talks with the jailed PKK leader Abdullah Ocalan to put an end to their armed campaign. Prime Minister Tayyip Erdogan said his government would continue anti-PKK operations until the Kurdish militants laid down their arms. Mr Erdogan called the incipient peace negotiations a test of intentions. The PM also said security forces in Turkey would be on alert to avoid big demonstrations of the Kurdish minority against the deaths of the three activists. Reports from Iraq say that a number of jet fighters have been attacking PKK rebel hideouts close to the Turkish border. The number of casualties of the air strikes is still unclear, and the Turkish government has not confirmed the attacks. Last year saw some of the heaviest fighting with the PKK in decades. The group, regarded by the US and EU as a terrorist organisation, launched an armed campaign for an ethnic Kurdish homeland in south-east Turkey in 1984. Mystery still shrouds the deaths of Sakine Cansiz - who founded the PKK along with Ocalan - and Fidan Dogan and Leyla Soylemez. The three women were found shot execution-style at a Kurdish centre in the French capital on Thursday. No group has said it killed the three women while Mr Erdogan has suggested their deaths may have been intended to sabotage peace efforts. According to news agencies, thousands of Kurds travelled to the Parisian suburb of Villiers Le Bel to honour the dead. The coffins stood draped in Kurdish flags inside the community centre amid flowers and burning candles. Since the conflict began, more than 40,000 people have been killed.